We may live in the age of internet and smart television, but when it comes to advertisements, outdoor displays have not lost their appeal yet. They have existed for hundreds of years and will exist in the future as well due to the major advantages they offer to marketers. In fact, over the past decades, outdoor display ads have evolved radically and help businesses promote their products and services in innovative ways. Earlier, there were only billboards and banners, but now you have flags, umbrellas, games, tents and much more. Let's try to understand the benefits you can enjoy by investing in outdoor displays. # Reach: Everyone talks about the reach of internet and television, but what they don't tell you is that millions of people around the world don't have access to the marvels of ultramodern technology. Therefore, if you give ads on web and TV only, you are actually missing the opportunity to grab the attention of millions. On the other hand, outdoor displays can be viewed by anyone and everyone. Whether you are targeting the upper strata of the society or the lower middle class, nobody can miss a promotional flag or banner, because unlike TV and internet, viewers don't need to pay anything to watch the ads. A TV or internet ad stays live for a few seconds only, but an outdoor display stays for hours and grabs all the passerby's attention. Suppose you want to promote your newly launched soft drink and plan to advertise it on TV and banners. The TV ad may not get customers' attention if they leave the TV set for a few minutes, but a banner ad stays on the spot all the time. Nobody can miss it. The cost of shooting an ad campaign and then buying space from websites or time from TV channels is a very costly affair. On the other hand, you can easily contact a company that manufactures outdoor displays and they will create graphic-rich, durable outdoor product/service display for you at affordable cost. Since the ads are printed on tents or umbrellas, you don't have to pay anything extra for placing them somewhere. If you are attending a trade fair, your tent can be your ad with all the information about your products displayed on it. Outdoor displays can be placed anywhere. Therefore, you can select the places where they will capture maximum consumer attention. For example, the major traffic crossings in a city are the best places to put billboards. Due to traffic jam, people sitting inside cars look outside for something that can help them pass the time and the billboards serve them in two ways. They get entertained and also find information about the products/services they may need. Outdoor displays are made using durable materials and can be used repeatedly. For example, retractable banners can be taken from one corporate event to another throughout the year for brand marketing. As banners display crucial information about products or services, they are never outdated like television ads. 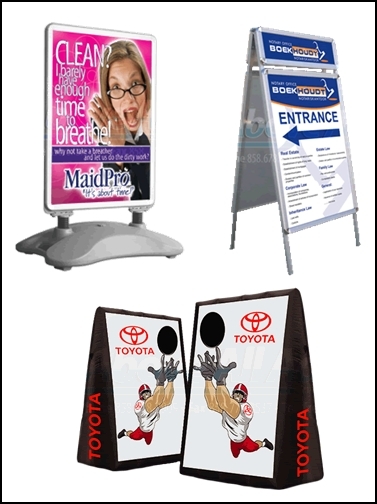 If you want to promote your business using outdoor displays and enjoy the aforementioned benefits, contact a reputed custom advertisement product maker today.